Welcome to F&B’s Woodstock location in Shenandoah County. Located near the historic section of downtown Woodstock, we’re close to the Woodstock Cafe and Shoppes as well as many other businesses and restaurants. It’s easy to get to F&M Woodstock whether you’re travelling on foot or by bike or car. We have plenty of parking in our side lot and you can bank on the go and 24/7 with our drive-thru and onsite ATM. Our welcoming building has a bench out front and distribution boxes for local newspapers. Stay a while and enjoy the downtown ambience after you’ve finished your banking transactions. F&M has been a true local bank in the Shenandoah Valley for over a century. 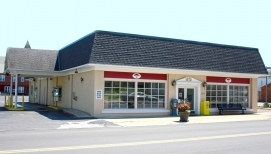 Main St. is in our Woodstock branch address and it also informs our approach to community banking. F&M is dedicated to investing in thriving towns where our customers and employees live and work. Our charitable and community initiatives include a Teacher of the Month award, annual calendar photography contest, Casual Fridays for Charity, and more. When you’re looking for banks in Woodstock, VA, choose a bank with deep roots in the community. Our financial services and products help our business and personal customers grow and reach their financial goals. We understand that small businesses are at the heart of every vibrant town and that people want genuine service without excessive fees. Call us or stop by today to meet our friendly and knowledgeable team. We look forward to discussing your financial needs and goals.